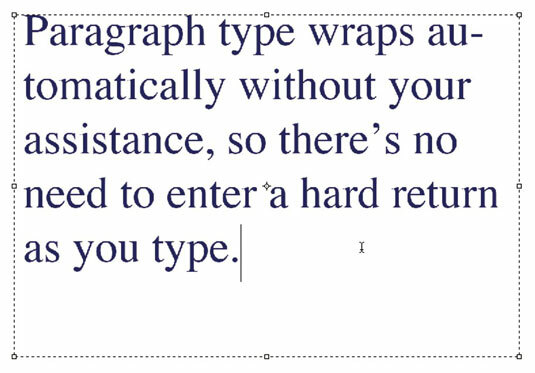 Paragraph type in Photoshop Elements 11 is similar to the text you enter in a word-processing program, except that it’s contained inside a text box or a bounding box. If you have larger chunks of text you want to enter in an image, entering the text as paragraph type is the most practical option. While you type into a text box, the lines of text wrap around to fit the dimensions of the box. If you resize the box, Elements adjusts the wrapped ends to account for the new size. You can type multiple paragraphs, use typographical controls, and rotate or scale the type. You can easily resize paragraph type (and point type, too) by entering a new point size value in the Tool Options without having to reselect all the text. Just make sure that the text layer is selected in the Layers panel and that the Text tool is active. This approach works for all other text characteristics as well. Select either the Horizontal Type tool from the Tools panel or press the T key to select it. If it isn’t visible, press T to cycle through the Type tools. You can also select the particular Type tool you want from the Tool Options. The cursor looks like an I-beam, similar to the one you see in a word-processing program. Drag to create a text box close to the size you want. After you release the mouse button, you can drag any of the handles at the corners and sides of the box to resize the box. Hold down the Alt (Option on the Mac) key and click the image. The Paragraph Text Size dialog box appears. Enter the exact dimensions of a bounding box. When you click OK, the specified box appears, complete with handles for resizing the box later. Select Type options from the Tool Options. To start a new paragraph, press Enter (Return on the Mac). Each line wraps around to fit inside the bounding box. If you type more text than fits in the text box, an overflow icon (plus sign) appears in the bottom right handle. You can resize the text box by dragging any of the bounding box handles. Click the Commit button (green check mark icon) near the text (or press the Enter key on the numeric keypad). Elements creates a new type layer, as indicated by the T icon displayed in the Layers panel.